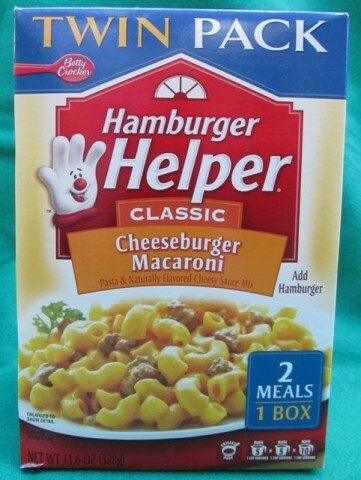 What’s Bueno At The 99¢ Only Store: Hamburger Helper! NOW here’s a fun one! It’s our old friend Hamburger Helper. Well, Betty Crocker, which is it?! Because you can’t have it both ways, there, sweetheart! You can’t have it both ways! This is exactly the kind of thing I’d have sent in to the back page of “Consumer Reports” where they showcase this sort of packaging absurdity on a monthly basis. But not after I submitted that Little Debbie thing last year and 1) they didn’t use it and 2) they didn’t even have the common decency to lie to me and tell me they liked it but then give me some stupid reason why they wouldn’t use it “but please keep pitching us more stuff,” which is what a good editor does! Seriously, editors: As the print industry continues to die off, you lazy bastards might want to think about getting back to everyone who submits something, no matter how completely unusable our ideas are! Not only is it good business practice, by Godfrey, it’s common courtesy! Do you think Bennett Cerf got to where he was by just ignoring every pitch that was emailed to him while focusing instead on those joke books that we all enjoyed as children? In a word, no. But thank God he wrote those joke books, right? And where did he find the time? Between crafting such masterpieces as the riddle about the big red rock eater, and his appearances on “What’s My Line?”, I don’t know how he had time for anything else at all. Yet he did. Yet he did. You folks should know better than to get me started on Bennett Cerf! Ha! Where were we? Because they sell the exact same thing in the grocery store for anywhere from about $1.25 to about two bucks! 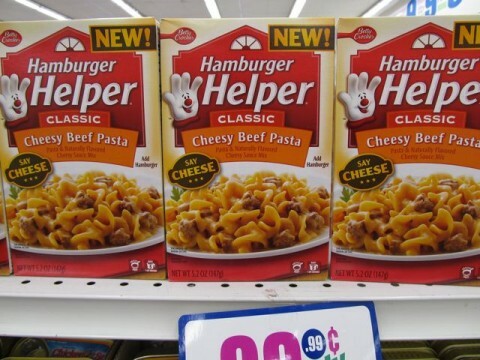 Only a fool buys Hamburger Helper! …Eh, for full price in a grocery store, that is! It’s like she said just that! Yes! A Twin Pack! That’s twice the Hamburger Helper you’d get at your Piggly Wiggly, your Food Lion, your Grand Union – for like less ’an half the price! That’s right: Less ’an half the price! A regular box of Hamburger Helper at the 99¢ Only Store is “bueno” enough, right? So how did we luck out with these enormous, industrial-size, institutional-quantity, need-a-pallet-jack-to-move-’em, double-size boxes of Helper available for 99¢ only? Perhaps the phrasing at the package’s lower right corner front panel, “2 Meals, 1 Box,” subliminally reminded shoppers of a particularly infamous viral video and thus entire shipments of these Twin Packs were shunned – left to gather dust in your Publixes, your Kashes & Karries, your CalaFoodses. Now, that’s just a theory. But it’s one worth considering. Oh, wonderful. Now I won’t be able to eat it, either. And I bought like twelve boxes! Posted by Ted on February 1, 2012, 4:02 AM.